Revista de Anúncios - Business Review ! To bring you the highest quality services, we have selected our products with great care. As often as possible we have chosen ammonia free alternatives for our colors and straightening hair treatment. We wish to provide complete satisfaction and beauty to each person who comes to our salon, through personalized service and care. “At Anything For You Salon & Day Spa” we will pamper you every way in a fun and relaxing atmosphere. People think the beauty industry is about supermodels, but our job is to make everyone beautiful. 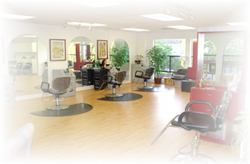 It is our pleasure to be able to bring complete satisfaction and beauty to each person who comes to our salon. We are wedding specialists. Our team has skills to provide the Bride, Groom, and entire wedding party, the Best Services !